"Cottage ham is one of my favorite dishes to eat because it's rich in flavor and incredibly simple to make. Requiring only five ingredients and five minutes of prep time, this dish could quickly become a go-to meal in your household. If you can't wait the hour it takes to cook, drop it in a slow cooker in the morning, and it'll be ready when you get home." Put ham into a Dutch oven. 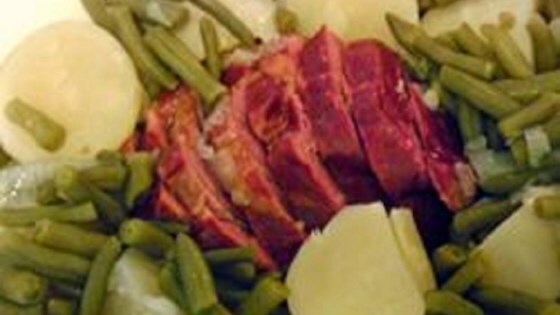 Arrange potato halves, green beans, and onion slices around the ham. Pour enough water into the pot to cover the vegetables completely. Place a cover on the pot and bring the water to a boil, reduce heat to medium-low, and simmer mixture until potatoes are completely soft, about 55 minutes. Remove ham to a cutting board to slice to desired thickness; serve with vegetables. This recipe can be prepared using a slow cooker set to Low for 8 hours or High for 4 hours. Green beans can be fresh or frozen without affecting cook time. Any firm variety of potatoes may be used, but cook time should be shortened for smaller varieties. This is one fo the easiest meals and my family loves it. It is even better the next day!